Michael and I spent the weekend house-sitting at my mate's property up on South Head. It has to be one of my favourite places and is so awesome to explore. I still get lost! They even have their own private mountain bike park with heaps of single track in steep pine forest and an orienteering map of the whole property. What more could you want?! On Friday I was up there by myself (well, other than all the animals) so I went for a good long run through all my favourite tracks then, after a rather brief dip in the pool (it's definitely starting to get a bit too cold for that kind of thing!) I took my bike out for a bit of a spin. Saturday Michael and I took the bikes out for a long ride through some of the many trails. Awesome day for a ride. We had planned to do a 3 day kayaking trip up the Queen Charlotte Sound which is in the Marlborough Sounds at the top of the South Island. We drove most of the way up from Christchurch the night before. After camping in some random spot on the way up to Picton the night before we were supposed to start our trip we woke up to fairly stormy conditions which only got worse as we drove North. After a quick chat to the guys we were going to be hiring our kayaks off (Sea Kayak Adventures in Anakiwa) we arranged to postpone the trip by a day as apparently the weather was supposed to clear by the afternoon. Trees blocking part of the Queen Charlotte Drive. Some parts of the road were flooded and driveways seemed to have turned into waterfalls. This seemed a bit suspect but turned out to be true so we made the most of a beautiful afternoon by heading out for a run along the track to the end of the Snout. From the end of the Snout you got an awesome view of the waters we would be kayaking in the following day. The gravel road leading to the Snout track ahead. The next day dawned beautiful and calm. I was so excited that I couldn't sit still on the whole drive over. We were shown our kayak (a SeaBear Packhorse) and given a few instructions, a map and a lifejacket and spray skirt while we packed our gear away in the compartments (you can pretty much take the kitchen sink with you!). We were then driven over to Ngakuta Bay where we began our kayaking adventure. The kayaks all packed and ready to go at Ngakuta Bay. Ours is the one on the left. Michael was in the back on steerage duty and navigation while I sat in the front in charge of pacesetting (and eating scroggin). It was pretty awesome to see the landscape around us from so low down in the water. The hills rise up incredibly steeply from the water covered in thick bush so most of it is not accessible except by sea. We were making excellent time and thought we'd stop at Allports Island which is just out from Picton for lunch 'cause, well, it was an island and islands are cool! We did some studying of the map and decided we were tough enough to get out to Blumine Island for the night which I was very excited about! Michael studying the map at our lunch stop on Allports Island. It was a long paddle from Allports Island out to Blumine Island but fortunately the wind seemed to mostly be in our favour. The kayak is pretty stable so there isn't too much fear of tipping in but it can get quite exciting on big waves! I was pretty relieved to get to the campsite and pitch our tent for the night. There were heaps of wekas running around determined to steal your stuff which was pretty funny. We sat on the beach watching the sun slowly setting over the water which was pretty magical. The following day we struggled out of bed feeling a bit sore and slowly got ourselves ready for the paddle ahead. First up though was a quick paddle round the corner to another bay on the island to explore some gun emplacements which was pretty cool. The view from the room from one of the gun emplacements...you can see why they built here! It was then time for a battle back across to the coast from Blumine Island with a strong headwind. I was in the back this time and on steerage which was a little scary because the waves would cause the rudder to turn the opposite direction to where I wanted it to go but I slowly got the hang of it (but Michael had to listen to me panicking for a while!). We finally made it into Ratimera Bay for a late lunch and some lazing in the sun. Lunch stop at Ratimera Bay. It was about 4:30pm when we finally got around to packing up again and paddling round to where we had planned to camp for the night. This next paddle was by far the hardest of the whole trip. Okay, the hardest paddle I've ever done by a long long way! There was an epic headwind on the headlands and there was about 5 minutes where it felt like we were going backwards no matter how hard we paddled. My paddle was getting caught in the wind and nearly taken out of my hands. It was quite scary and SO exhausting but somehow we got around the corner. If only it had gotten easier after that but it was still a real battle into the wind. Arriving at Kumutoto Bay was such a relief. We were greeted by the guys who had started their trip at the same time as us which was awesome 'cause they helped us get the kayak ashore and seeing friendly faces when you are as exhausted as we were is pretty cool. Standing on the jetty at Kumutoto Bay. The campsite was pretty cool...all tucked away under the trees. And unlike the previous night there was no tap for water so we had to collect it from the two streams on either side of camp. It was a most magical place. Our campsite amongst the trees at Kumutoto Bay. After staying up quite late playing cards by candlelight with some of the others camping in the same spot I was exhausted so slept like a rock. We were a bit sluggish in the morning (and the sun was taking its time in arriving) but I was relieved to find it was much calmer than the day before. Setting off into beautiful calm water on the morning of the third day. We paddled off for the final day of our kayak adventure at a much more leisurely pace than the previous two days which was pretty cool. I was, again, in the back steering and was definitely feeling like I'd got it mastered. Taking in the awesome scenery. We actually managed to be paddling faster than a few of the smaller yachts sailing around in the Sound which was quite funny. Being so much calmer it also gave me more of a chance to really study the landscape around me. It is incredibly beautiful. If only there weren't so many boats! This would be great if I wasn't on steerage duty! We went round a few headlands until finally paddling into Mistletoe Bay for lunch...along with a whole lot of other kayakers who seemed to come from no where. It was the first tidal beach we'd encountered too so we had to make sure we pulled our boat out of the water enough so it didn't float away on us. Lunch stop on the third day at Mistletoe Bay along with a few other kayakers. After lunch we set off and stopped at one more bay for a little bit of a relax in the sun and also a bit of a look at the start of the Queen Charlotte track which you can both walk and mountain bike on. It was so peaceful I would have loved to have stayed for longer (another night?!) but we had to press onwards. From our final stop it was a fairly short paddle back to Anikiwa to meet our van but it was quite exciting to surf with the waves and then dodge all the moored boats. I was pretty tired when we finally made it ashore but I was pretty sad the trip was over because it had been so awesome. I can't wait to do another kayak trip! Maybe Abel Tasman or Doubtful Sound next time? The end of our trip...Anikiwa. So I had an appointment with a podiatrist a little while ago and I had to bring all my current running shoes along which got me thinking about just how many pairs of shoes I have. Actually, a lot of my friends and family find this really funny because I have very few everyday and dress shoes (I wear them until they have holes all the way through then realise I need a new pair). Anyway, I thought I'd show you some of my shoes. Below are my road shoes. They are actually just 3 versions of the same model, the Mizuno Wave Nirvana (4, 5 and 6 with the newest pair on the left in the photo). I have an older version somewhere too but I don't run in those anymore. It was nice to have the podiatrist confirm these shoes were pretty much perfect for me on the road. Below are my offroad shoes. I have 2 pairs of the Inov-8 Roclite 295s (1 is quite old and the fabric around the front of the foot has been ripped several times) and 1 pair of Inov-8 Flyroc 310s. I am looking at getting something a little more cushioned in time for the World Rogaine Champs in late November but we'll see. 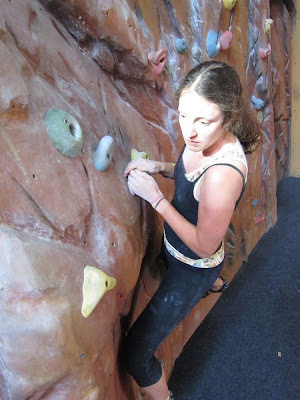 The flyrocs served me really well for the 12 hour last month but my feet were pretty sore afterwards so I can only imagine what 24 hours is going to feel like! This is not a complete collection of my shoes. I also have a couple of pairs of cycling shoes and a pair of climbing shoes but we'll get to them on another post. I love the Waitakere Ranges and I try to head out there as much as possible. It's an awesome place to run and there is so much I have yet to explore. On Friday, despite the forecast of some horrendous storm, I thought I'd head out for some training and luckily the worst of the rain held back until I finished! This particular loop is one of my favourites: starting at the bottom of Falls Road you head along Upper Kauri track (up and up and up!) then Sisam, then Chateau Mosquito (and your first river crossing), then RGB (the second river crossing and the track is steep and nasty), then left onto Ridgeline, down Fenceline (you pass one of the reservoir lakes) and then back to the carpark via the Auckland City walk. The track goes along the side of the river to the right...yep, along the narrow bit of rock sticking out from the water so you have to be careful you don't slip in. The first river crossing is further along. About to head down the RGB track...probably the part I find the hardest. I'm awesome! And I made it back before the rain came! "You must keep your feet grounded so firmly on the earth that it's like you have four legs, instead of two. That way, you can stay in the world. But you must stop looking at the world through your head. You must look through your heart instead." As I said in my last post, I had a friend come visit me for the weekend...after picking M up from the airport we thought we'd go roam the supermarket because that's what people do on a Thursday night right? Amongst other random buys (chocolate was the essential reason for the supermarket trip) I discovered this packet of chips in the International isle. I mean, how could you possibly pass up a flavour of chips called Mrs H.S. Ball's Chutney? What could possibly be more appealing?! We ate them all on the car ride home. Of course, this might indicate that they were delicious or something. Rather they were weirdly sweet (well, they were chutney flavoured after all) but awfully addictive...if that makes any sense. We went out for breakfast but I didn't take my camera which was pretty slack but in my defense we actually weren't planning on breakfast (well, we were...just not right then). Because neither of us checked out the address of our morning destination carefully enough we had to postpone morning plans till later and go eat before I turned into a monster. So we went to Raw Power since we were in town and I had their tofu scramble. It's really good...but clearly camera-shy because every time I've had it my camera has, well, not been there. Oh, and we may have had a giant melting moment cookie as well but that might just be a rumour. I do, however, have a photo of lunch...which isn't exactly pretty but still tasted good. I suspect that after biking out to Kumeu most things would have tasted quite good though. We had to retreat to a bus stop to hide from the wind and rain. Typical Auckland (there was blue sky in the morning, then it rained, then it was blue sky again...repeat until you get exhausted...but the weather never does). We were up at my beach house the next day (after arriving late at night from basking in the Waiwera Hot Pools until we turned all wrinkly) and for breakfast I made us both the Banana Flapjacks from Vegan Brunch. They turned out really delicious (between the 2 of us we easily polished off the whole batch) but I really need a non-stick frypan because I was wrestling with the old cast iron one which was determined to destroy all remnants of a good mood. Luckily I'd given M prior warning that I was likely to turn into a monster when it came time to try and turn them over so he didn't panic when I started cursing. Served with peanut butter (well, mine was anyway), blueberries, soy yogurt and golden syrup. Quite awesome. This is a muesli bar from my local bakery. They are awesome (the bakery specifically but also this muesli bar)...heaps of vegan options and if you are avoiding wheat or gluten, well you have quite a few choices too. ...okay, who am I kidding?! You don't have to drag me out for any adventures (as for the predator fence, Tawharanui Reserve is a penninsula protected by what they call the predator fence to keep, well, predators out...turns out it keeps humans out too if you don't cross at the proper gates so I guess that makes us predators as well)! A big bowl of stir-fried veggies and tofu sausages mixed in with a packet of curry/soup (it tried to claim it was both which was a bit confusing) and served with spelt toast smeared with my Mum's kumara and sundried tomato hummus. Oh, and a bottle of Phoenix Cola. Can't go wrong. And then it was time (well, after lazing on the couch and watching the news about the earthquake in M's hometown which was a bit scary) to head back home which is always a bit sad. I'd like to stay up at my beach house forever.